There was no Honary Fellowship Awarded this year. 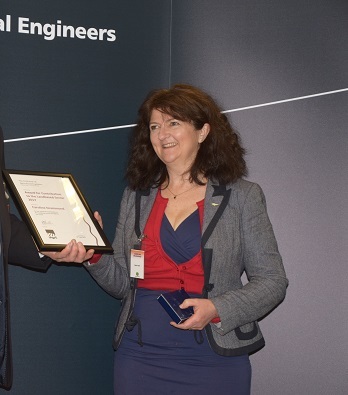 David White CEng CEnv FIAgrE said it was an honour and a privilege to be selected to receive such an award, which would be displayed in pride of place on his desk at home. Caroline Drummond Chief Executive of LEAF expressed her sincere gratitude at being selected for the award and was particularly taken with the breadth of expertise from the delegates. 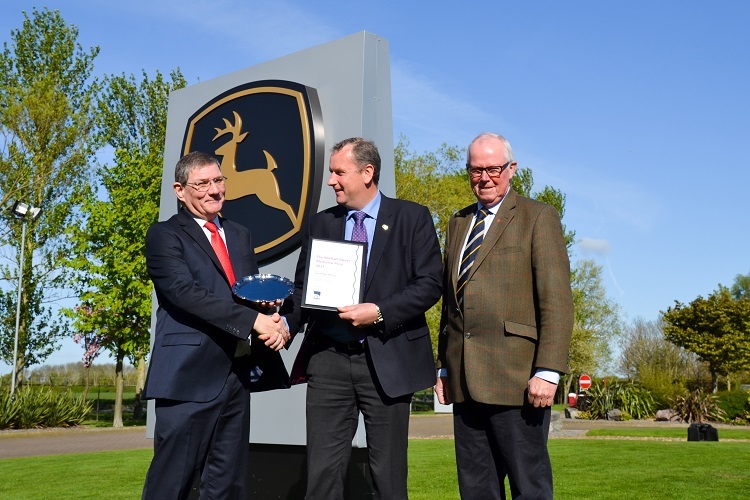 Jonathan Henry, Managing Director of John Deere UK was unable to attend the Awards Presentation but was pleased to welcome Alastair Taylor and Past President Peter Leech to Langar, where they presented him with his Prize. David Clare, Wrekin Branch really enjoyed the day and was particularly happy to have the opportunity to catch up with some old friends. 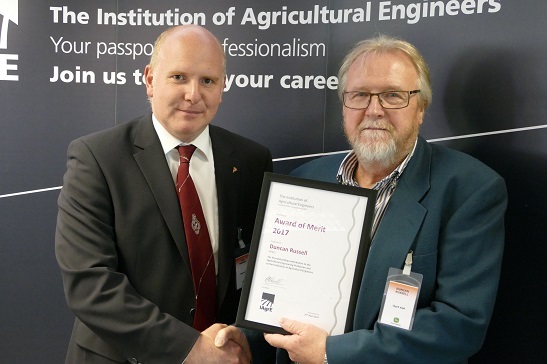 Nick Handy CEng MIAgrE, Western Branch thanked the Institution and the President for his award and said it was very humbling to have his efforts recognised by the Institution. 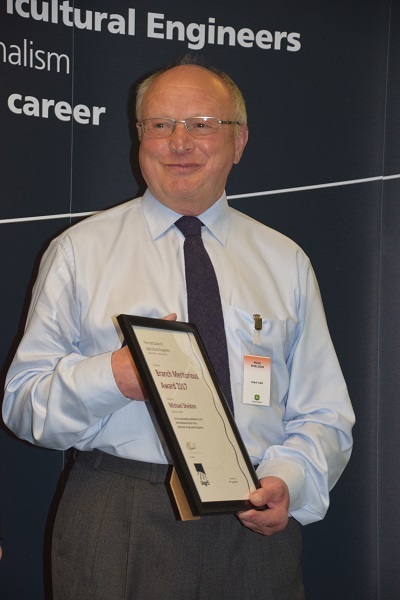 Mike Sheldon West Midlands Branch, conveyed his thanks to all involved for an excellent day, he was delighted to have been able to attend and accept his award. 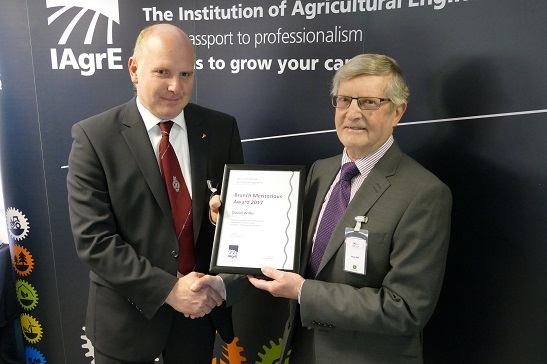 David Wilks East Midlands Branch, was very pleased to accept his award and very much enjoyed the day. 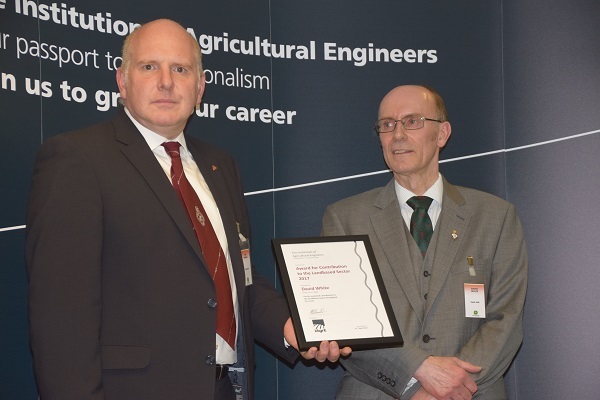 A second Award was made this year for an article written for the Landwards Journal by Malcolm Carr-West entitled "Ethical Engineering, could the VW scandal happen at a British Company, and what woul dbe the consequences?" 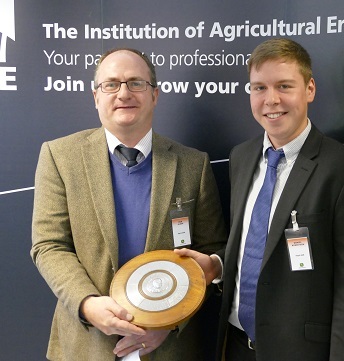 IVEL Award - This award is made at the LAMMA Show to a new product that demonstrates the most positive contribution to the environment, This year's IVEL Award went to The Witham Group based in Lincolnshire for their new range of lanolin based lubricands The Prolan Range. 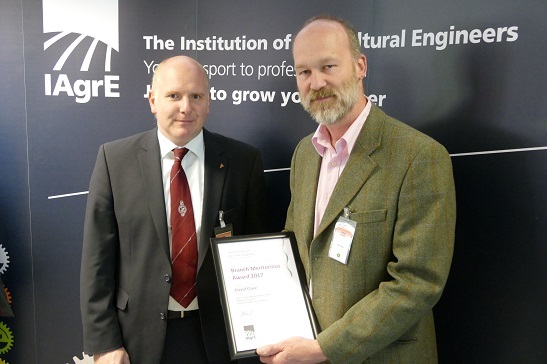 Nigel Bottom, Witham Group Chief Executive was delighted to attend the Awards Presentation and collect the Ivel Award on behalf of his company. 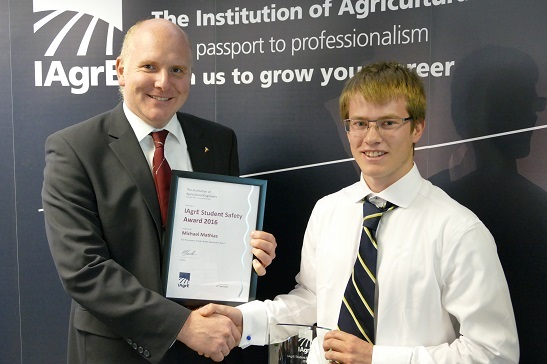 Johnson New Holland Trophy Paper Award - This trophy is awarded for the best final year project submitted as part of a First Degree, HND or HNC course in land based engineering. Daniel Robertson for his thesis, written whilst at Harper Adams University entitled: “Experimental Studies into the benefits and drawbacks of vibrating a conventional winged subsoiler tine”. 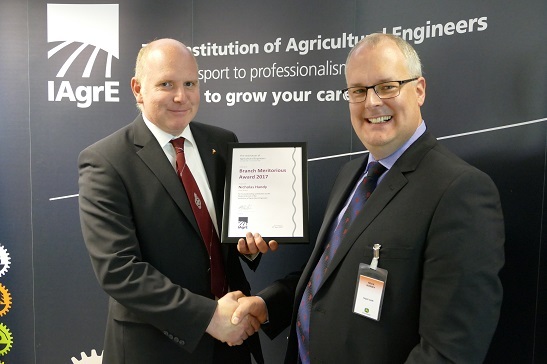 Daniel received his award from Rob Alker from CNH Industrial, who was delighted to see such skills and enthusiasm from young people entering Agricultural Engineering. 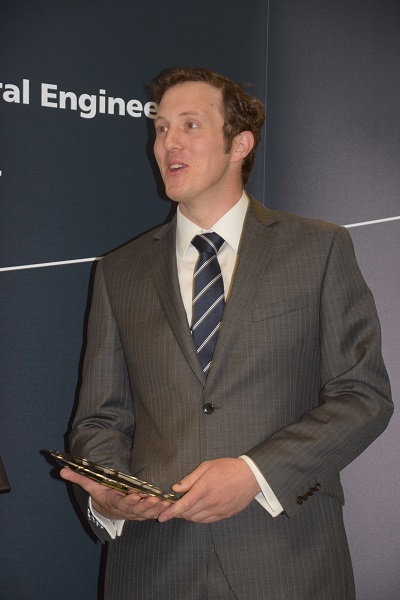 Student Project Award - This award is given to the best final year project submitted as part of a course leading to ND, NVQ Level 3, or similar qualification in land based engineering. 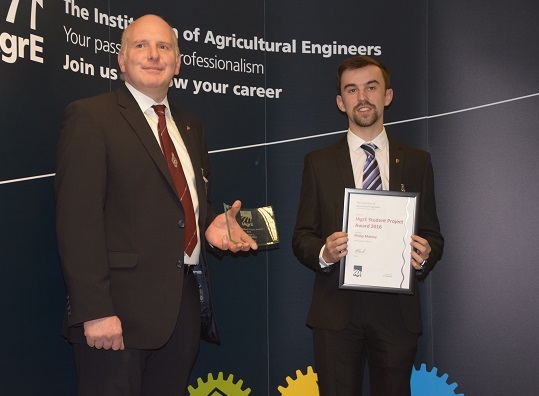 Philip Mattey won the award whilst at Coleg Sirgar for his project "Roto 8", a bale stacker designed to assist him on the farm at home. He is now studying off-road engineering at Harper Adams University. 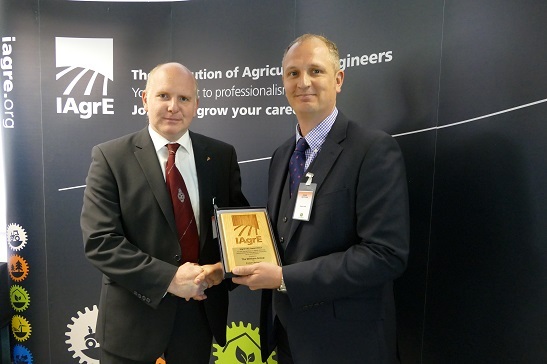 IAgrE Safety Award - This new award has been established to encourage and recognise innovation in safe design or operation of equipment or processes by students studying agricultural engineering or subjects related to the application of engineering and technology to the land based sector.